Rare is the story that takes readers out of this world and into another.Rarer still the story that captures heart, soul, and mind...leaving the reader forever transformed.This is that story.Dive deep and enter the Circle.The Circle is an epic story of evil and rescue, betrayal and love, and terrorist threat unlike anything the human race has ever known.It beings when a man named Thomas hunter finds himself being chased down an alley after working the late shift at a coffee house. When a bullet grazes his head, he awakens in an entirely different reality. Now every time he falls asleep, he wakes up in the other reality--and every choice he makes impacts the fate of two worlds.At long last, all four novels in this groundbreaking series have been brought together in one adrenaline-laced volume.Four novels. Two Worlds. One Story.I'd give the series 20 solid stars, if I could!! This series changed my life!! Ted Dekker is a poet, he writes with such conviction that you can't help but take every word to heart! This is and will forever be my favorite series! The characters are phenomenal! I love that story takes the creation of mankind and intermingles it with the end of times! The way he weaves the two realities together is flawless!! I also love that this series plays a part in so many of his other books! Like The Lost Books, The Paradise novels, House, Immanuels Veins, and now The Mortal Series. It all has to do with the blood! He makes the villains so vile and evil, they scare the socks off you! He is master of his Craft!! Read a Dekker book and you will be a fan no doubt!!! Finished reading the first of the novels in this volume: Black. The story alternates between two realities with a great deal of action in each. Ted Dekker is a very skilled writer who captures and holds interest throughout. I am so glad I have all four books to read at once because waiting for them would be torture.Finished reading the second of the novels in this volume: Red. The heroes in the story fight staggering odds to save both realities. Nothing is certain and there are many trials. I am anxious to continue reading.Finished reading the third of the novels in this volume: White. This is a fantastic story. There is so much action, so much sacrifice, and so much love. I read this very quickly and am looking forward to the next volume.Finished reading the final novel in this volume: Green. The story continued to a marvelous climax. There was much tragedy, but much beauty. I found this book an amazing read. The battle of good and evil told in its pages is entrancing. I highly recommend this book to everyone. It is one to be treasured. This book was major fantasy which I don't read. It reminded me of the Matrix movie. I loved how the author had a great grasp on the love of God. The "Great Romance" is what I have been studying and this was a confirmation for me. It was a nice distraction. Some may not like how the evil is portrayed but to me this is how the supernatural realm and the enemy really work. I really wanted to like this series, and for the most part I did. I got through one book but partway through the second in the series I had to quit. I haven't any other series by Ted Dekker and checkout all four books in this series at once anticipating my enjoyment. This series relies heavily on previous books and on the reader's knowledge of those previous books, events and people. For someone new coming in to this series, I constantly felt lost, left out or this overwhelming feeling of missing out on something that I needed to catch-up on. These feelings really prevented me from enjoying the books and series in the way they were probably intended to. I'm guessing that if I had read other series with some of the same characters or connected characters by Dekker that I would have thoroughly enjoyed this series. It is eventful in action and character development. I liked the idea of crossing into far past and current history with characters that bleed into both and affect both, but the assumption of great background knowledge prevented me from finishing this series. When an author strives to awaken our minds to ideas and passions that we already know, we find that many fall short. Not that they don't write good literature, but that one needs to walk away and say that their actually life's have been changed because of it. I have read these books a few times and find that with each reading, I am challenged to go back to my own beliefs and see if there is passion. What I see as sometimes bleak and sad, is that I have allowed something so personally passionate to become routine and boring. In this trilogy of sorts, we are taken from not having a clue to understanding that in the end all that matters is love. Maybe I am just a romantic, but this group of books made me realize that I pale in comparison to the one who invented the great romance.Very much worth the time and energy. I give the first three books of the circle series, "Black", "Red", and "White" 5 stars. I have not read 3 novels quite as hungrily...."Green" was so much more gory, and even though these 4 books are truly a circle series, I would highly recommend beginning with "Black." I was SO GLAD that I ended with "Green" even though the Kindle version started with it.Overall, well written young-adult, Christian fiction. It is somewhere along the lines of Narnia meets the Lord of the Rings....a fantasy thriller with the salvation story interwoven. I look forward to the other two series, "The Lost Books" and "The Paradise" novels. Very good realization and imagery, bringing spiritual struggles into stark physical reality. Extremely creative and colorful writing. The books were written in a cyclical path, this particular collection starts with Black, but contains an alternate ending to Green if you wanted to start there. Overall, the series started off slowly, but the intensity ramps up continually until the ending/beginning. Overall, a great read, and a great twist on a timeless tale of redemption. I have actually only read Black and I thought it was a very entertaining story. Any story about a man who can go to sleep in one world and wake up in another is always gonna be an interesting story, but dieing in both world's and not knowing which world is real makes it very interesting! Black is definitely a book that keeps you on the edge of you seat. All four books were excellent! This is a series that is fast paced, takes you to another world, and leaves you with a lot to think about. I thoroughly enjoyed every bit and will definitely be reading it again. This series of books is a fight between good and evil. While C.S. 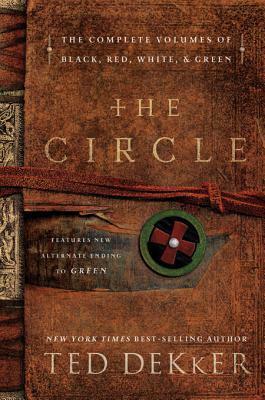 Lewis had his Chronicles of Narnia, Dekker has the Circle series. There are similarities of man's fight between his thirst for God and the lures of evil. Truly a great read from beginning to end. Love this series. One of my favorites by Ted Dekker. I would definitely recommend, especially to someone who hasn't read anything by him yet. This is a good place to start.Dive Deep. I couln't read each page fast enouph! Wow what an author! I would love to see a movies made from this series. goodness these were the best books i ever read, no exaggertaion! I liked the Circle series a lot, they did have some very slow parts however. But neverless they were hard to put down and very addicting to read. These are my favorite books of all so far. I was romanced, mesmerized, and smitten. My heart forever belongs to this series. Very unusual but a compelling read. Makes you think! I read right through all four books. Overall rating: 3.5 stars.This was the focus of my (Not So) Great Dekker Reread. (Not So) Great in that I only read my favorites of his books that I'd previously read and didn't bother with the ones where the suspense was the only thing that kept me going on them. Anyway.In this volume, I read Black, Red, and White. I did not read Green, though I did read the alternate ending. More on that in a minute. All three books were good- but not as great as I remembered. Compared to some of the other books I've been reading, mainly Sanderson and Stengl, these seemed almost shallow. Maybe that's because there's a lot more focus on passion and emotion, which was great for mildly-angsty-six-years-ago me but less great for decidedly-not-angsty-right-now me. Or maybe it's because, while Dekker does a great job of showing human depravity and God's love despite it, he doesn't seem to show brokenness in the same way I've come to expect of a story like this. As I said before, I didn't reread Green because I remember very clearly why I disliked it (horrible ending, creepyness of a type that I didn't want to deal with right now, Billy, Monique's daughter, characters who are idiots, Monique's daughter, disappointment). However, as I said, I did read the alternate ending, and I approve. I'm not sure what I think of Dekker's decision to change the ending, but I do like the new version much, much better. All that said: while I may not like these books as much as I used to, I still enjoyed the reread, and I'm glad I read and loved them when I did. They shaped who I was then, and more importantly, they shaped my stories, some of which wouldn't exist if I hadn't discovered Thomas and Rachelle and the Green and Black Forests. So, yes, I'm not as big a fan as I once was, but I owe these books and their author much, and I am grateful. This is actually the entire 4 book series. I had already read (listened to) all 4 books but I wanted to read the alternate ending for book 4 in the series. The only way anyone can get the alternate ending is to get the entire 4 book series. I got it from the library, turned to near the end of book 4 and then read the two endings that Ted Dekker offers his readers. I definitely liked the alternate ending that is offered only in this 4 book option. I challenge everyone to read both endings to book 4 and then make up your mind which one you like. WonderfulFrom the first sentence, I was drawn in. I experienced the joys and pain as the story unfolded. Thank you! Note to reread....I remember this series being incredibly impactful and profound, but also long and complicated. WowThis is an incredible series. I started reading the first book and kept going through the entire series. The portrayal of evil was a work of art. Ted Dekker will Always be one of my favorite authors. So when my Dad gave me this Book of 4 books.... I was So happy. I first I was very confused, but after reading I began to enjoy it. I tried Book Zero first and to really understand you need to read Book One. This was a fantastic series. It was very well-written and engaging. I highly recommend it. I thought this was a great series. Although they were recommended to me several times, I never read them individually as Elyon intended. I only read them in this set and thoroughly enjoyed them. They were not at all what I expected and were a pleasant break from the cookie-cuttered fiction that riddles our electronic shelves these days. The story is fast paced for the most part and I got through the whole series in about two weeks. I am assuming (but too lazy to look) that this set is the one with the alternate green ending when I state that the alternate ending was good, but I was just plain satisfied with how things had already turned out. I am sure that this ending was a delightful bonus for those that were reading as the books came out originally, but for me it felt like overkill. It was well done and I enjoyed it, but it was like having one more bite of cheesecake when you’re already stuffed to the brim. It was upsetting to me that ***mild plot spoiler*** the main characters kept losing faith in Elyon only years after he was there in the flesh performing miracles in front of their faces. I understand that this was one of the points that Dekker was making about society in general, but it still bothered me. Perhaps it is my own jealousy that is making me feel this way, as I believe in a God without ever physically being in his presence while these folks were doubting him while he was standing ten feet away. Yes, yes, I know God reveals himself to us through other people’s actions, shows his love to us in many ways….etc, but I am talking about being able to actually carry on an audible two-way conversation with him and still doubting his existence. That bugged me a bit. Elyon was being treated a bit like Superman. “Elyon, if you really REALLY love us, then you will show up right now and fight this bully.” Although this irked me a tad, it certainly didn’t ruin the books for me. I thought it was a great story and Iplan on reading more of Mr. Dekker’s works. Okay, so I feel like I ought to justify my reasons for not giving this series five stars--it was very action-packed, chock-full of twists and turns, and very well thought out. It is not for those who are irritated by a constant swinging back and forth between two worlds/dimensions/times/however you want to think of it. I enjoyed the ride, the symbolism, and the (VERY obvious and not at all hard to pick out) focus on the struggle between good and evil, even the focus on Christianity and a relationship with God was very well done, which is a very difficult thing to incorporate without it seeming too contrived. Where things went bad for me was when (view spoiler)[ I realized that it was a LITERAL CIRCLE and that you're in a freaky time/dimension loop. Now, mind you, this was my own stupid fault for not realizing what I was getting into with a series actually called "The Circle," not knowing it was coming. But it made me really angry, because it is endlessly frustrating to know that there is no way to go on from here--your characters are in a circle. That will keep going. In circles. (hide spoiler)] It was just really frustrating and for that reason, I will never have a desire to read it again. It was 100% worth the read the first time, I enjoyed the story and many-faceted plot, I followed through, but for sure will never again return to that situation. Ted Dekker - Ted Dekker is known for novels that combine adrenaline-laced stories with unexpected plot twists, unforgettable characters, and incredible confrontations between good and evil. Ted lives in Austin with his wife LeeAnn and their four children.